At the dawn of human existence a young boy named Crookleg has mastery over a new kind of magic. His people, deeply superstitious, curse him for they fear his magic will harm the barley crop and the community. But Crookleg finds himself not agreeing with their opinions. His magic, the ability to make pictures of animals eventually finds him cast out. When he ventures into the dangerous lands beyond his home he finds danger, a new name, starvation and eventually family. 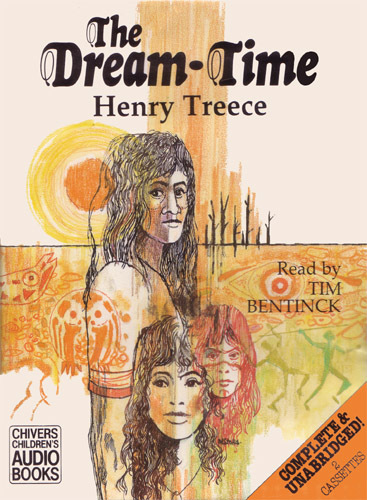 First published in 1967 The Dream Time was the last novel written by Henry Treece, a specialist in historical fiction. I first encountered Treece in the early 1980s after hearing the entirety The Lord Of The Rings. My uncle, looking for another book to read to me, produced a slim boxed trilogy of paperbacks that were themselves thinner than just The Fellowship Of The Ring alone. But as my uncle read me the story I soon learned that what Treece lacked in wordiness he made up for in craft. Treece was a poet, a surrealist of prose and had a gift for maximizing the value of words by careful selection and placement. Hearing Treece’s Viking Trilogy it felt as deep as The Lord Of The Rings – no small feat. To be fair though The Dream Time isn’t very long at all. At just two hours it feels only just longer than a short novel. The world Treece describes in The Dream Time is one full of primitive beliefs. Its inhabitants have an ultra-limited technology, none can write, little metal exists and communication with neighboring tribes is as dodgy as communicating with animals. The Dream-Time feels as universal and surreal as one can imagine for a history based book. One blogger described the way Treece writes as “Romantic Surreal dreamshock … [Treece’s characters] were human too, he suggests; they understood things differently but their ideas seemed as valid to them as ours seem valid to us.” – and that is a good way to describe it. Narrator Tim Bentinck gives a sympathetic reading, even the villains in The Dream-Time understandable. If you want an artful living breathing history (or in this case prehistory) look to Treece.